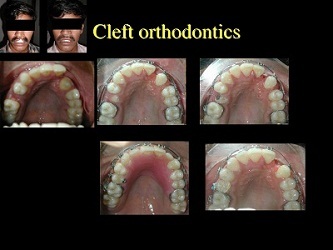 Orthodontics-Craniofacial Cochin - The Comprehensive Solution for all Craniofacial Problems. 1) Braces — the most common fixed appliances, braces consist of bands, wires and/or brackets. Bands are fixed around the teeth or tooth and used as anchors for the appliance, while brackets are most often bonded to the front of the tooth. Arch wires are passed through the brackets and attached to the bands. Tightening the arch wire puts tension on the teeth, gradually moving them to their proper position. Braces are usually adjusted monthly to bring about the desired results, which may be achieved within a few months to a few years. Today’s braces are smaller, lighter and show far less metal than in the past. They come in bright colors for kids as well as clear styles preferred by many adults. 2) Special fixed appliances — used to control thumb sucking or tongue thrusting, these appliances are attached to the teeth by bands. Because they are very uncomfortable during meals, they should be used only as a last resort. 3) Fixed space maintainers — if a baby tooth is lost prematurely, a space maintainer is used to keep the space open until the permanent tooth erupts. A band is attached to the tooth next to the empty space, and a wire is extended to the tooth on the other side of the space.